The preliminary rounds for the most important TI event of the month have concluded, producing 16 heroes that will compete in the double elimination playoffs this weekend. Beyond The Summit's meme tournament has lived up to its hype, and then some. The filler show for the gap between the TI8 Qualifiers and TI8 Main Event has turned out to be the main centre of attraction, even overshadowing the BTS Summer Cup. Regardless, the tournament has not been without its fair share of controversies and questionable results. Heroes have been disqualified, items and abilities were banned and certain rounds had to be rerun. It doesn't come as a surprise to see that 9 out of the 16 heroes that have qualified are Strength heroes, allowing them to survive the initial blast of magical nukes that most of the successful heroes are capable of dealing. Heroes that had Blade Mail in their item builds were also very successful, forcing a new ruling to be made that only allowed the item to be purchased in the level 15 round. One of the biggest upsets was the elimination of Spectre, the top seed of the tournament and a favourite to advance to the main event. She was eliminated by none other than Phoenix, who is surprisingly the bottom seed in the playoffs. However, this may simply have been due to tough matchups in the previous rounds. A main point to note is the fact that both Leshrac and Terrorblade were eliminated from the tournament early on, due to the fact that their spells somehow bugged their opponents and stopped them from being able to cast any spells. Also, Wraith King's ultimate Reincarnation as well as Undying's talent for the same were prohibited due to their tendency to bug or crash the game. This was possibly a large factor in the former's elimination from the tournament. 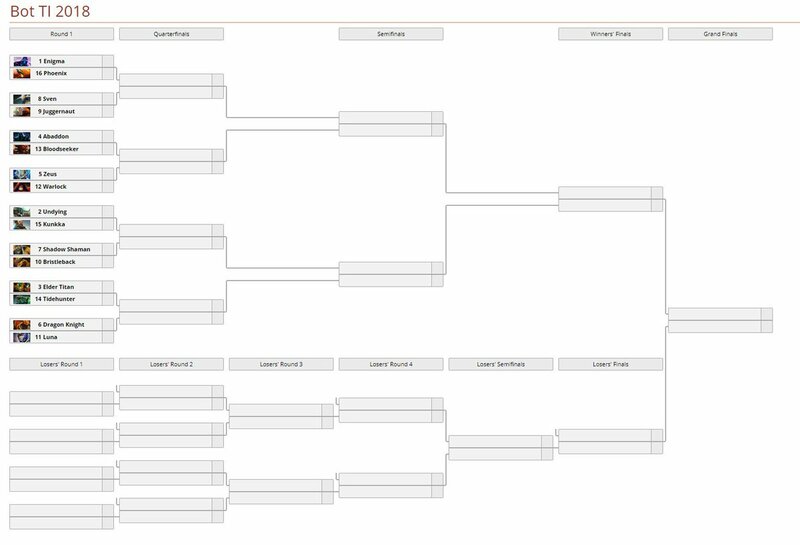 The 16 remaining heroes have been seeded into a double elimination playoff bracket, where they will play a Bo3 series against each of their opponents in the same manner as they did in the previous rounds. The seeding is determined by their individual results from all of the rounds they played prior to this, including scores tallied from every single round. The highest seed will go up against the lowest seed, and vice versa. However, fans rooting for the lower seeded heroes need not worry, as each hero has a chance at redemption in the lower bracket, in the off-chance that they have to face against an unfavourable matchup early on. Perhaps the single biggest factor that made this event such a success was the talent that built up the hype, tried to get into the mind of the bot and make complex predictions in a display of raw passion that even got us rooting for our favourite heroes to win. There are some familiar faces and some pleasant surprises in the list of talent for the main event. Special appearances by: David "LD" Gorman, Commissioner David "Blaze" Dillon & others! VODS have been made available courtesy of Beyond the Summit from their official YouTube channel. If watching all the VODs is a bit too much for your tight schedule, take a look at this condensed and concise profile of all the 16 heroes that advanced to the playoffs, and how they got there, thanks to the selfless and dedicated members of the community on Reddit. 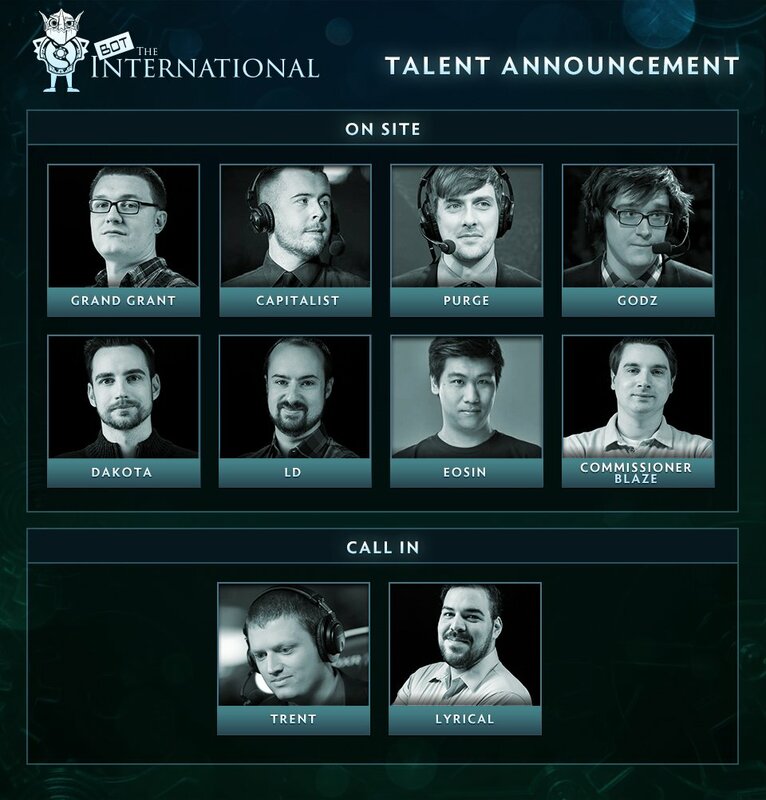 The final 16 will compete at the Bot TI Main Event from July 14th to 15th (12:00 PDT/21:00 CEST). All matches will be broadcast in English on the BTS Twitch Channel. Also, you can head to the tournament's official page to view the brackets and make your own predictions on who will win each round. Should the winner of Bot TI receive an all new Arcana as a reward? Yes, all that hard work should be rewarded! No, the community votes should decide! Brilliant event by Beyong the Summit , the way they imitated the Ti production was fun .. the interview , player profiles .. Everything was just so great , Well done and great that you shared the article.